In a recent discussion around disruptive energetic activity in someone’s house a question arose that often comes up in such dynamics: What do you do when a visiting energy doesn’t honor boundaries? Many people at some point encounter energetic or spiritual activity in their home or workspace that they find disruptive, disturbing, or flat out frightening. Most often, how that energy is dealt with determines how well the dynamic finds balance. I’m careful to distinguish “energetic” from “spiritual.” Sometimes the activity in a space is due to odd fluctuations in the etheric field and has nothing to do with spirits. In this case, balancing the elements of the space can bring relief. Likewise, there can be a spiritual presence that readily exhibits a personality or humanoid traits, such as a female form or voice. Ultimately such disturbances indicate a different kind of energy out of balance and don’t carry a “good” or “bad” judgement. They just indicate that something needs attention. For most people it is the element of surprise that is bothersome. This is true whether the disturbance is another person coming up behind them or an insect popping out. Once they get their bearings on the situation they manage it by asserting a more suitable way to approach, or by determining if that particular bug can roam freely in the house. With the boundary set, things calm. It’s no different with spiritual energies. In the case of a spiritual interruption, we set boundaries, such as, “It’s OK if you’re here, though I allow no physical contact,” or “It’s OK that you’re here, though please no surprise visits.” What happens when the energy doesn’t hold up its end of the peace? In order to understand why an energy doesn’t honor a boundary, let’s examine what that energy may be and its reason for making itself known to start with. There are many scenarios under which spiritual activity happens, and I can only touch on a few here. Figuring out what sort of visitor is present is key to resolving any unrest it causes. Some visitors warn about dangerous situations. Once the danger is removed, the energy moves on and disruption stops. Others are enticed into a peaceful environment and simply want to enjoy it. Some don’t know they’re deceased and don’t realize they need to move on. Others perished traumatically and are locked in a PTSD dynamic, acting out their demise until someone understands that’s what’s happening and helps them move on. In some cases a paranormal disturbance can indicate trouble in the home. The phenomenon referred to as “poltergeist” activity isn’t necessarily a spirit visitor at all, but an unconscious projection of a person in the household (usually a child) who has been traumatized and doesn’t have the communication skills to express their distress. 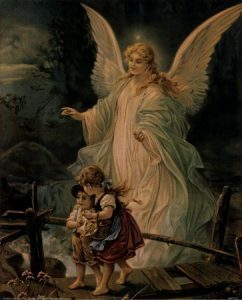 Another frequently occurring phenomenon is the visitation of spirit guides (or as some call them, guardian angels), who shake up the environment, particularly in the case of children, budding intuitives, or empaths who refuse to acknowledge their Other sight. Even in the case of a visiting guide–beings we often assume to be gentle angelic creatures–we question their need to sometimes be forceful or frighten us. Sometimes we have received gradual small signals that we may have ignored or just didn’t process as spirit communication, so a bigger display of need finally gets our attention. Another way to look at it is by considering that spirits are beings from a foreign country and they don’t speak the language, or don’t know the customs. They don’t know that disembodied voices in the night scare us, or that dropping onto the mattress while we’re sleeping is a bit rude. Again, that element of surprise prevents us from perceiving friendly interactions, or at least misconstrued actions with good intentions. Hence, this is the reason the accepted historic accounts with angels always begin with, “Fear not!” Moving past that initial shock is what determines whether we get the memo. All of that said, when we have such experiences an opening for them has to be created somewhere. Sure we can feel so terrified by spirit interaction that we run screaming from it and never look back, and no such contact happens again. The cultural myth of “fire in the head” exists for a reason, though I think it’s somewhat misunderstood. We’ve all read legends of the old man who heard voices and went crazy, or the young girl who was visited by spirits that wouldn’t leave her alone. The message handed down has been that if we don’t accept the task of becoming a seer or conduit of the spiritual world in some way that bad things will happen. I think it’s more benevolent than that. In my experience we don’t have to take on the whole arena of what a spiritual encounter may mean, even ones that are very personal. We don’t have to quit our jobs and move to an ashram in India or suddenly become vegetarian and take herbalism classes. It may mean that kind of sweeping life change for some people. What it demands without question is that we honor that we had an experience outside of our understanding, that we allow that one little interaction to open our understanding of All Things. That’s all. In that light when we have a challenging spiritual experience and we refuse to acknowledge it, chances are the environment will become more restless, not because we are cursed or are refusing the leadership of a spirit guide, but because we are refusing some wisdom to light within ourselves. This is the reason that instead of dismissing energetic adversity we open a dialogue with it. This is why instead of shutting down that part of ourselves we set boundaries for how we can accept it. We do so not because we need to control the unseen, but because we have had a spiritual opening, an opportunity to learn something about ourselves. Still, what if we go through all of these things and our visitor is still being obnoxious? I tell clients to keep two things in mind. The first is that All Things are connected, so when we speak from our truth, All Things actively participating in that connection recognize that fact and honor our needs. Create the habit of observing and regrouping when caught offguard–seen or unseen–and set a boundary not out of shocked fear, but from personal truth. It works. The second thing I tell people when a visitor isn’t honoring their boundary is, because All Things are connected, consider what All Things is trying to communicate something important. It may be about us, about the energy, or about the environment. There is a reason it is persisting, the least of which is to be merely bothersome. A final consideration is if the experience has traumatized the individual it’s very hard to find a place of balance from which to set boundaries. Activity will likely persist until the PTSD of the individual can be released. In our western culture we don’t have the community Crone sitting by the campfire scrying out the best way to do this year’s crop planting or helping us make sense of experiences that don’t fit our norm. For this reason I actively teach people how to soften their experience of Other and to learn to integrate it into their lives. Western culture is the only thriving population on the planet that regards paranormal activity as astounding, riveting, or disturbing. All other cultures have integrated it into their experience of everyday. As a result of our separation from our spiritual perception, we panic when it seeks to reunite with us. I first met my spirit guide when I was about twelve or thirteen. I woke over years finding him standing at the foot of my bed, or at the end of the hall when I got up for water in the night. All he did was stand there, but that was all it took to terrify me. I didn’t learn who he was for another fifteen years. For that reason through private sessions, classes, and Distance Mystery School, I’ve committed to create a new tribe of support for children and adults whose lives are blessed with such experiences and an uncontainable inner knowing. I’ve committed to create The Tribe of the Modern Mystic. As you feel led, I’ll be waiting by the fire. I have a dynamic chaotic energy in my house. There were over 50 discarnates, all but 2 have been sent on. They refuse to go, the base of the butte where my house is… Is their land. But they make tapping, popping and clicking noises only at night. I sleep through it now. I tried to make boundaries but they just make noise in my room no matter what. This has been happening for months and I just live with it. Not too happy about it, even after multiple visits from multiple shamans its always the same. They are just nasty it would appear. When I was about 13 something was trying to get my attention, but it frightened me and disturbed my sleep. I saw an object raised up by invisible forces, that scared me the most, then all activity stopped. I find myself thinking about these events often. How do I start communication again, with less fear? The short answer–will it to be so.” The more thorough caution is learn the ropes before setting that intention. Only allow lightbeings in your space and to communicate with you. Set boundaries. Focus healing on yourself so that you stay in the best balance that you can. Feel free to email me with any questions.